This audio description has been compiled by Trish Wheatley in February 2018. It was commissioned by Disability Arts Online on behalf of NDACA (the National Disability Arts Collection and Archive). It is read by the AUTHOR/NAME OF READER. It is approximately 5 minutes 50 seconds long. 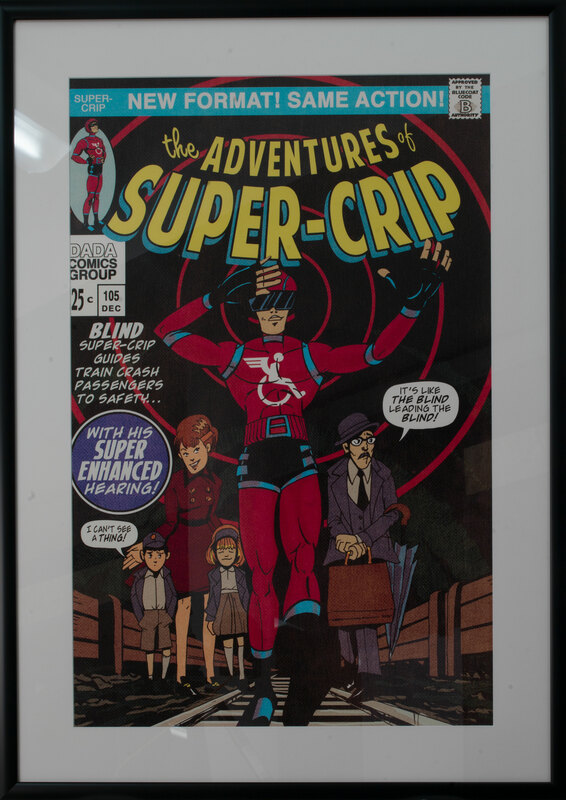 The issue summary provided in full caps handwritten text typical of comic books reads “BLIND: Super crip guides train crash passengers to safety… with his super enhanced hearing!” The comic title ‘The Adventures of Super Crip’ is written in large yellow font with a blue drop shadow, with the words ‘the’ and ‘of’ in small handwritten style. A blue bar runs across the top of the poster with the text: ‘Super-Crip New Format! Same Action!’ A small white box in the upper left of the poster displays black text reading ‘Dada Comics group 25cents’ Above this box there is a small avatar of Super-crip standing in profile set against a blue oval. Lawrence Clark is an internationally-acclaimed comedian, writer and actor who has cerebral palsy. He has a long history with DaDaFest, launching his career at their inaugural 2001 event. His shows are observational, pointing out the absurdity of life and human behaviours, often featuring situations he encounters as a disabled person who uses a wheelchair. He makes use of powerpoint and projected video in his shows to great comic effect. Tunney explains on his tumblr site that “The term ‘super-crip’, in basic terms, is used to refer to a common stereotype found in the media’s portrayal of disabled people; smiling, happy, can-do types who are often outrageously praised for always striving to “overcome” their situations. Laurence examines the stereotype by way of lampooning the traditional image of famous comic book super-heroes… many of whom have an impairment themselves (Professor Xavier, Daredevil, Thor/Donald Blake). Tunney’s artwork blatantly references many 60s Marvel characters in the work itself. It was commissioned as part of a series of 1000-word essays to mark the launch of NDACA, funded by Heritage Lottery Fund, Joseph Rowntree Foundation and Arts Council England.